Before my husband starting attending Thanksgiving dinner, we never even had bread stuffing. I grew up with rice stuffing as our Thanksgiving staple. This is the one dish that, to me, tastes like Thanksgiving. The combination of the herbs and spices with the crunch of pecans and celery are simply perfect. 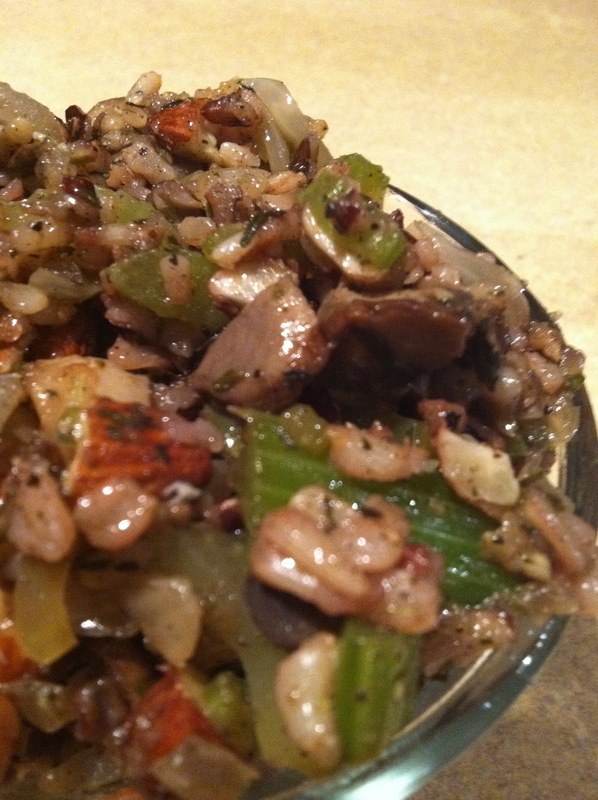 Consider brown or wild rice stuffing as a healthy alternative to bread stuffing. Bread stuffing is made, obviously, with bread, a refined grain, rather than an intact whole grain like brown or wild rice. Not only is the quality of this well-seasoned, whole grain dish better, it’s at least half the calories of traditional bread stuffing. So you won’t feel so stuffed when you eat this stuffing. ~ Be sure you have cooked rice. Rice can be cooked ahead and frozen to use in this recipe. ~ Consider making the entire dish and freezing for the big day. If you do this, save the nuts to add right before serving. In a large, deep saute pan heat the oil over medium-high heat. Add the veggies and stir around for about 5 minutes until they begin to soften. Add the broth and cover so that the veggies steam a little a bit. Add the spices and stir to coat the veggies. Add the rice and stir well until the veggies, spices and rice are well-blended. Add the pecans and mix up one last time.